In this discussion Dr. Shahid Rasool, Director, CEMCA opined that how the TRP crusaders are killing the Indian news quality. Media has never been asked about its implication on society. In India issues like Farmer’s suicide and declining job in different mills are not taking care by the media which is actual need of current time. So now Indian media is in 136th rank among 180 country, is a shame. Shri. AHM Bazlur Rehman, CEO & Secretary, Bangladesh NGOs Network for Radio & Communication told that how from Indigenous medicines to Indigenous music all have been privatized. There are lots of things going around us by the corporate houses which is not known to us even, he stated. He suggested that now we need a balanced law for both the voices and voiceless people. Now the serious problem is the Corporates have captured them, which has a terrible consequence. Shri. Dharmendra Jha, General Secretary, Freedom Forum, Nepal in his speech said that sharing correct information is the prime responsibility of the media but now media houses are not providing that even to the audience. And the current situation is demanding that the experts and new faces should bring back to the media house, or there will be demise in the value of media soon. Shri. MC Rashmin, Director, Srilanka Development Journalist’s Forum spoke about the lacking of editorial independency in the current scenario of media houses. People are not voiceless rather they are not allowed to speak, he stated. He prioritized on Media Budgeting, from which 20% of the total budget should go for community voice. He finally opined that Collective reflective exercise is highly needed in the present situation. Shri. Debabrata Patra, Regional Manager, ActionAid Bhubaneswar gave a clarity on how Actionaid reaching to the last community to bring up their issues on limelight and to give them justice whether its super cyclones or daily deprivations. But the work should be fact based i.e case studies which have greater impact on media as well as common people and most importantly the Government. Shri. Sudhir Pattnaik, Editor, Samadrustiin his excellent speech opined that “Democracy is least important today and media is a part of corporate world now”. He also said that the GDP of the state or nation never counts labourer’s labour, so calling it economic development is foolish. Dichotomy between state and society is increasing day by day which has no good resulton Media, so there is need of hour for cooperation and federation of all houses from civil society to media. During the session a book entitled “Community Radio for Change” was released by the panelists which published 40 success stories of community radios based in different states of country. In the second session the theme discussed about Community Media: Connecting Women, Children & Unheard Communities towards ascertaining their rights was moderated by Lopamudra Tripathy, C4D Officer UNICEF. The panelists discussed regarding the scope of community media & social media to ascertaining rights of the under privileged communities , women & children. Many innovative initiatives were presented by the panelists taken in different parts of south asian counties. Journalist & Community Media Specialist N A Shah Ansari, Chairperson of Namaskar community Media Network described the aim & objective of the Media Talk & Odisha Media Award. In the Odisha Media Award ceremony 20 awardees are felicited in 17 categories. In print category,Bamapada Tripathy, editor, Samaj felicited with Editor of the Year by Odisha Media Award and Dr. Santosh Kumar Mohapatra as Columnist of the Year. In Television Category, Bada Khabar (Prameya News 7) awarded as Best Television Show (Current Affairs), Rajashree Sahoo (Otv) as Best News Presenter. In Radio Category Anitya Mohanty, AIR Cuttack, felicited as Best Radio Presenter. In common category, Anuj Kumar Das as Best Reporter (People’s Issue Reporting), Bibhuti pati as Best Reporter (Developmental Reporting), Amjad Badshah as Best Reporter (Developmental Reporting), Aiswarya Parija as Best Reporter (Gender Issue Reporting) are felicited. Best Reporters award for Community Reporting have given to four awardees like Jitendra Beura(Malkangiri), Sisir Panigrahi (Brahmapur), Bijaya Dwibedi (Bhawani Patna) and Swadhin Meher (Sonepur). In Special Category, BJB (A) College bags Best Media Institution Award. Rashmi Ranjan Parida,Founder & Director, Odisha Diary Foundation awarded as Inspiring Young New Media Entrepreneur. Gyanendra Ratha was awarded as Cartoon Journalist of the year. Asit Kumar Satapathy awarded as Photo Journalist of the Year, “Ghar Jana Hai” as Best People’s Cause Documentary, OmmComNews as Best use of New Media and Samanya Kathan as Best Blog of the Year. The Primary objective of Odisha Media Award (OMA) is to facilitate media coverage of people’s causes by recognizing & encouraging journalists and other media persons of the state of Odisha who through their works have championed causes of people while passing relevant information to empower the ordinary man. 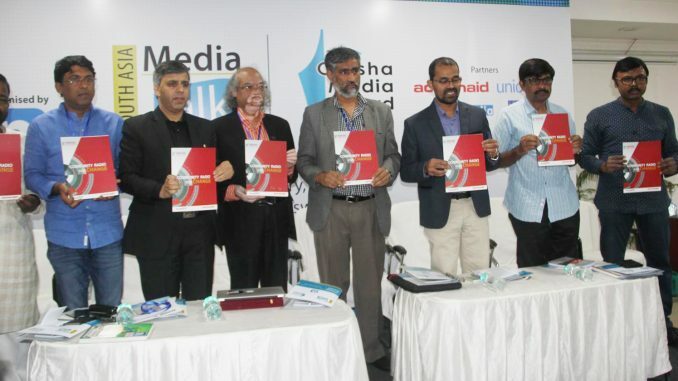 The South Asia Media Talk & Odisha Media Award was organized by Namaskar Community Media Network in association with like minded organizations like ActionAid, UNICEF, Young India, CEMCA etc.